Ford pulled out all the stops in redesigning the Edge. Forbes Magazine's 2015 Ford Edge review writer predicts: "Cars like the 2015 Ford Edge will make it harder for some to justify shelling out big bucks on luxury vehicles." It's true. The new Edge has an amazing list of standard inclusions and awesome options; but many a Phoenix resident will quit reading after "cooled seats" and just head for Surprise Ford with visions of frosty cushions dancing in their heads. The new 2015 Ford Edge, for sale in Surprise, is taller and longer than before, offering up additional head- and legroom for all passengers. Cargo space also increased; up to 39.2 cubic feet with all seats in use, or up to 73.4 cubic feet with back seats folded down. There are now three engine choices: the base standard 245-horsepower, 2-liter EcoBoost four cylinder; a 2.7-liter, 300-horsepower EcoBoost V6 in the Sport trim; and the mid-level 3.5-liter V6. All engines are paired with a six-speed automatic transmission with steering wheel-mounted paddle shifters. Can you say fun to drive? Edge's new four-cylinder engines pack a lot of punch. For instance, an all-wheel-drive Edge with its standard four-cylinder EcoBoost and optional tow package rates a 3,500-pound tow capacity, suitable for pulling a small trailer or boat. But the real story behind the new Edge is all the upscale options. Dress up your new 2015 Ford Edge in Surprise with advanced connectivity and infotainment features, ultra-protective, injury-reducing, inflatable safety belts, a hands-free liftgate or a panoramic sunroof. And did we mention cooled seats? They're actually heated and cooled, so snuggle into your warm seat on a cold January morning and you won't need to bring that jacket that you always forget at the office when it's 80 degrees by 3 p.m. Newly available high-tech safety systems include adaptive cruise control, adaptive steering, collision warning with brake support and an enhanced active park assist. For a more complete list of features, watch the 360-degree video tour as our 2015 Ford Edge review for Surprise SUV shoppers continues. 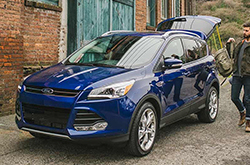 Compare Ford's newest model of the Escape to its rivals and we're more than confident that you'll choose it over vehicles like the 2015 Subaru Forester, Honda CR-V and the Toyota RAV4. Shoppers will be won over by the Escape's splendid styling, as well as its convenient features. When comparing its price to the vehicles in its class you will clearly see that Phoenix Ford customers select it because it's a remarkable value. The bullet list under this text will give you even more details! 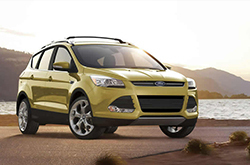 Now that you've read the 2015 Ford Escape review above, please contact Surprise Ford for a test drive. Because it's a hassle to get reviews with up-to-date? specs on dealer sites, we've made it our job to provide reviews from veteran writers. Once you commence reading, you'll find that this article is overloaded with vehicle specs in a set-up that's easy to read. Use it to get the info you need to make an educated purchasing decision. 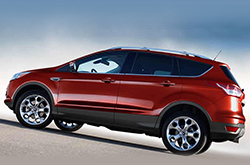 Please visit our Ford review and compare directory if you feel the Escape is not made for you; there you&ll learn about Surprise Ford's entire lineup.